Black eyecatcher !! A mare by which you foal in love ! Beautiful black Oldenburger mare by Jazzman / Delamanga / Fidermark with elastic movements out of Grand Prix damline in foal to Janeiro Platinum for 2019 !! 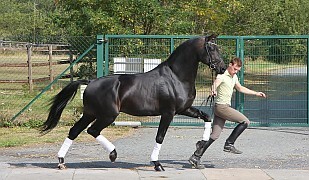 She is realy a black juwel for dressage and breeding, because she shows a lot of swinging and elasticity in her movements . Also she has big movments, good activity in the legs behind and enough freedom in the shoulder. Nevertheless, she is on the video still very young, she shows her very beautiful neckline and the talent for dressage through her good movements. 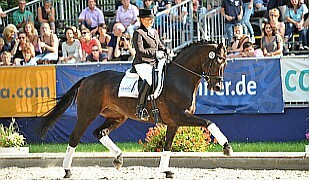 Black dream for dressage and breeding! 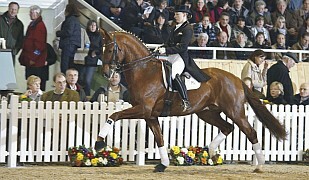 Jazzman as of of the breeding index highest son of the dutch starshire Jazz. 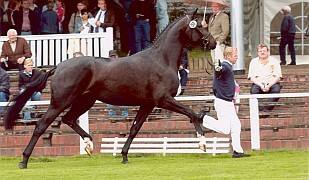 Delamanga as reserve champion of the south german licensing (his father Dr. Jackson was 11 years under the top 1 % of the german breeding list and was one of the breeding index highest sons out of the great Donnerhall line ) And with Fidermark comes on of the greatest german dressage stallion in the pedigree. Also the damline of the filly is on of the best from Germany. 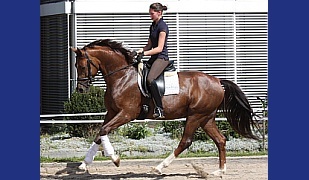 Dam line " Glocke" (from breeder Schulte-Böcker, which has already breed the starshire Florestan) .. Grandmother is fullsister to the german horse champion and Grand Prix horse "Fürst Fabio" and another brother also is successful in the internatinal Grand Prix arena. Little black Lady for dressage and breeding on highest level ! Has had already a stunning black premium colt by Dr. Jackson at her and is insaminated for 2019 with Janeiro Platinum (Sezuan/UB40) . 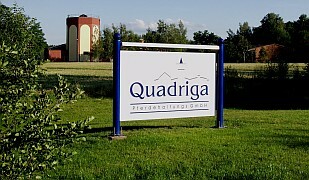 So she is still unbroken, but registered in the Oldenburger main stood book.